This article first appeared on Huffington Post. Click here to view. It seems like something out of a bleak novel. A dark police state where prisons are run by major corporations whose sole source of income is occupancy. This would be a story where nobody listens because the people crying foul are being seen as weak on crime and in defense of prisoners who have had their right of freedom taken from them. Let’s start with this. In the United States of America there are companies that profit if you go to jail. They want you to go to jail. These business spent over $45 million in lobbying to make sure when you get sent to jail, you go to their jails. They are so good at this that there was a 37% increase of private prisoners between 2002-2009. They are currently outpacing state and federally funded prisons. There is no evidence that there is any savings in the use of private prisons. And I am not talking about violent prisoners who get long sentences. On the contrary, many people are in jail for non-violent offenses. This is not just adult prisoners either, many of these private prisons are housing youth offenders. The stories of abuse and terror at some of these facilities are shocking. This is an entire industry that lobbies politicians for more funding to fill their walls. An industry with little oversight, who makes money per prisoner, regardless of how little they pay yearly for this prisoner’s well-being. Remember this is a business, this is for-profit. In the end, this is a debt that can never be paid by most people… if they miss their payment day, their license will be suspended and additional fees will be incurred. Here it is in its simplest of terms. More prisoners incarcerated= more income for business. That is a very dangerous grey area of morality to be walking for the government. 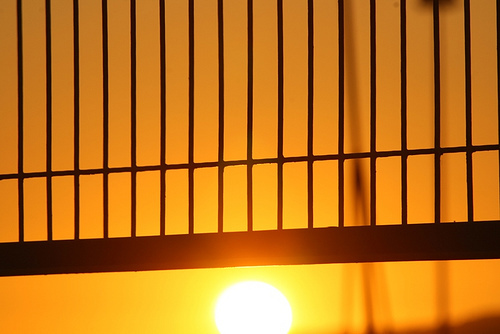 Prisons in Arizona receive a guaranteed income of 100% occupancy at $49.03 per day. Many inmates receive dollar store items such as a tube of toothpaste that is expired. My source claimed it was from 2005 (in 2012). A Bar of state soap, thumb toothbrush, 1 bendable comb, toilet paper once weekly, 5 Kotex and 5 tampons. Doctors cost inmates $5 per visit and $5 per prescription. States with private prisons have been observed to dole out sentences double the time of state-run prisons. Does this put judges in danger of incarcerating people who otherwise wouldn’t have been sent to prison because of the lobbying of lawmakers? Does this $3.3 billion mean corruption and forced sentences, kickbacks, and other increases in illegal prosecution? A prison in this scenario is a business, and when you are sent there… well, if you can’t afford a bar of soap, you will get it added to your account. If you can’t afford a meal, it will be tacked onto your account. When you finally pay your debt to society with time, you owe more in prison restitution. How do you get on your feet? For-Profit Prisons make money on repeat offenses. There will be no money for treatment because their income is based on the number of prisoners they have. Just like a hotel makes money on occupancy. The prison workers are lower paid than state workers. They are trained more poorly, and work with limited oversight, not by the government, but by individual corporations. The training found in one prison will be completely different in another… as well as the living conditions. Now you are seeing what many private prisons in the United States are run like. Except- Private Prisons could be bribing judges for more inmates. There is evidence that this is occurring regularly. That kind of corruption means that your DUI could turn into a maximum sentence. When people think of prisons, there is a conservative mindset of great food, workout equipment, entertainment, and a bunch of criminals with a lot of time on their hands having an easy life. Nothing could be further from the truth. Even the least notorious private-prisons are rife with inequality, dangers, and misery. A young, first time offender is often placed right next to a career criminal. There is a need for private prisons to have better oversight and regulations, if not be outright banned for the corruption it causes. With privatization we have seen a strong lobbyist presence, insider deals, and fraud. Florida itself currently has 7 privately operated prisons. According to the U.S. Department of Justice, the number of prisoners being added to privately run jails is outpacing the overall prison population by 17 percent. Again, the higher the occupancy the more profit. When you see a court document, it doesn’t say “Big Prison Corporation vs Defendant” it says “The State vs Defendant.” There is an obligation to ensure that prisoners are safe, that the populations around prisoners are safe and justice is served. In the end, we need to know that our government is in charge of our prisons and not the highest bidder.